A tree falls into power lines in Duarte as storms sweep through Southern California on Friday, Feb. 17, 2017. LOS ANGELES (KABC) -- A powerful storm moving through Southern California has knocked out power to about 61,000 customers in Los Angeles on Friday. The Los Angeles Department of Water and Power said its crews were working quickly to restore the power. 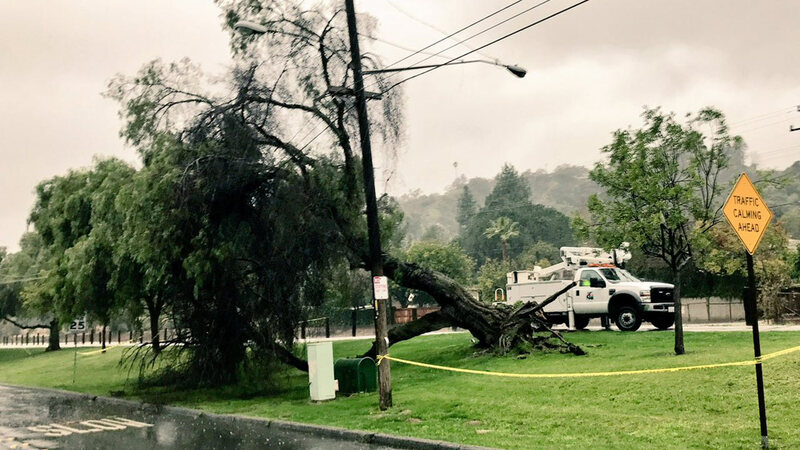 The LADWP urged residents to use caution near downed or dangling power lines or poles. If you see a downed wire, you should assume it is live and immediately call 911. Never touch a downed power line. For more information about the outages, click here.